I know not everyone observes Easter, but many of you do & I’ve had questions about made in the USA baskets & other ideas for what to put in them, so this is what I’ve come up with. I didn’t think I’d observe Easter last year, but won the Eco-kids egg dyeing kit from Raising Natural Kids so that spurred me to put together a little basket for my babe who had just turned one (photo attached). I put together a basket with his favorite things at the time: fresh, organic fruit & a few fun & useful things. The Moccasins are the only not-entirely made in the US item (made by Minnetonka Mocassins in the Dominican Republic of US materials). The boat is from Green Toys, and the bunny teether from Smiling Tree Toys (both linked to below). 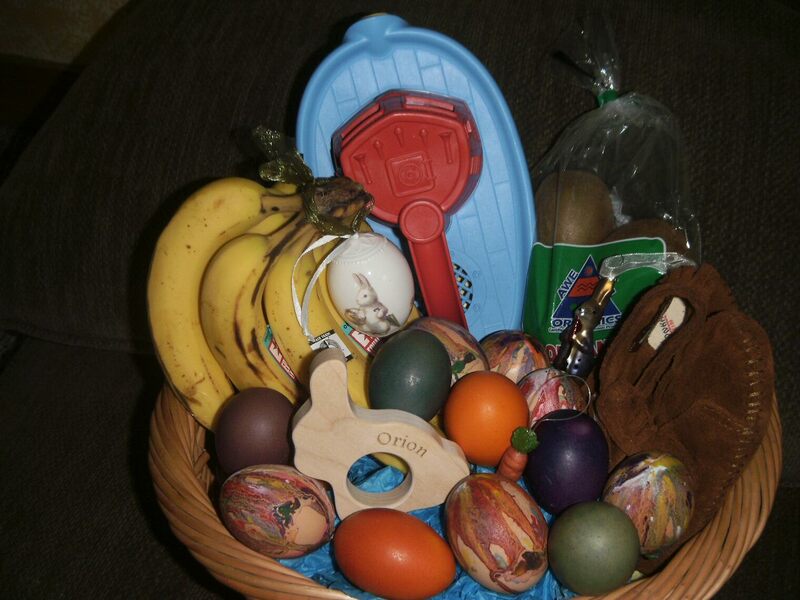 I used a basket I already had, and some Easter ornaments I’d been given in the past to finish it off. Baskets– Peterboro Baket Company, made in NH. Several Easter baskets to choose from: Handcrafted in the USA from 100% USA made materials. Most ~ $30, but you get a discount of around $5 if you buy 2 or more. http://www.peterborobasket.com/s-10-childrens-room.aspx. I realize these don’t fit everyone’s budget, but if you have a little kiddo like me & will be using it for many years to come it seems like a good investment to me! Also, Etsy several options to fit every budget:http://www.etsy.com/search?q=homemade%20Easter%20baskets&view_type=gallery&ship_to=US. Egg-dyeing kit: Eco-kids, made in Maine, $15.99 for kit. I used this last year & loved how the eggs turned out. I left some in for a couple hours, and ½ in overnight for a very deep, dark color. Comes with 3 primary color powder packs and a color chart to create 6 custom colors, a crayon for texturing your eggs and a custom egg dipper made right here in Maine. Under the exterior wrap you’ll find our exclusive creature cut outs to dress up your eggs. http://shop.ecokidsusa.com/product/eco-eggs. Also, Earth Paints offers a wooden egg paint kit, or egg dye kit. Also, see my photo below about using crayon shavings for a fun egg-coloring idea! Surf Sweets: “Fruitfully Delicious, Naturally Good! Surf Sweets natural and organic candy contains no high-fructose corn syrup, is free of artificial flavors or sweeteners, is allergy-friendly, peanut-free, gluten-free and totally drenched in fresh fruit flavor!” http://www.surfsweets.com/products.php. Available through the Natural Candy Store as well. Earth Paint (finger paints): http://www.naturalearthpaint.com/shop/childrens-paint-kit/. Eco Eggs: BPA-free Compostable plastic Easter eggs made from plants!! From their website: “Made in the USA from Plants, 100% Renewable Content, Plant- vs Petroleum-Base, Non-Toxic Durable Plastic, Less Energy Use and Emission Waste in Production, Meant to be Stored and Reused for Many Easters, Fully Compostable After Use”. http://ecoeggs.com/. ALSO, don’t forget the Eco-grass: eco grass is made from 100% post recycled paper. It is 100% recyclable after use. Eco grass is crinkle cut 1/8″ thick, can be kept and reused for many Easters or after use, you can dispose of eco grass in your paper recycle bin. http://ecoeggs.com/eco-grass.cfm. Bunny Teether– made in MN by Smiling Tree Toys. They are having an Easter Special ~ Free shipping + $2 off normal price (now $16) for Personalized Wood Teether . I put one in my babe’s basket last year, he was 1 at the time, I think it’s just adorable (see photo of last year’s Easter basket below) ! No, he didn’t actually use it as a teether all that much, but it does have some teeth marks on it. I intend to use it as part of his Easter basket annually, and maybe make it into a hide the bunny game as he grows a little older. It’s a great keepsake for years to come, and I LOVE supporting small businesses like Smiling Tree Toys! From their website: “Handcrafted from gorgeous, sustainably harvested hardwood, this little Easter bunny is an ideal and meaningful Easter basket toy for boys or girls. Softly curved for easy grasping, and hand sanded silky smooth for safe and natural teething. It’ll never wear out!http://www.etsy.com/listing/94624072/easter-special-free-shipping?ref=pr_shop. My made in the USA toy list– TONS of options for children of ALL ages:https://www.facebook.com/notes/eco-friendly-babyfamily-products-made-in-the-usa/awesome-battery-free-safe-toys-made-in-the-usa-list/488605551155090. Here’s a nice link with ideas for homemade baskets:http://faithfulprovisions.com/2012/03/08/homemade-easter-baskets/. • use a bonnet/hat/watering can/shoe box/flower pot etc. (something that can be reused). 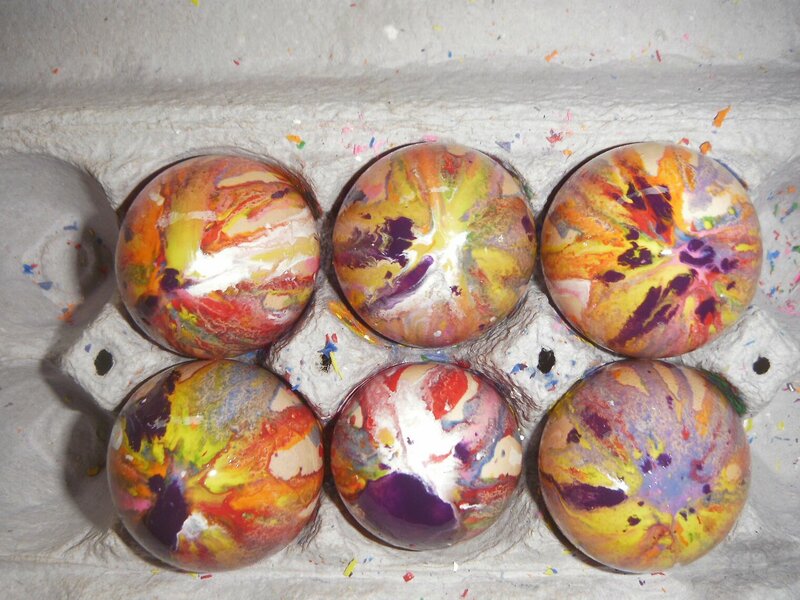 These eggs were lots of fun to make, just drop crayon shavings onto hot eggs! I can’t wait to do this with my babe when he’s older, but I sure had fun doing it myself. I’ve been saving little pieces of broken crayons all year for this!